The proposed residential redevelopment of a commercial site in South Road, Ockendon to provide 3 residential units has been approved by Thurrock Council. 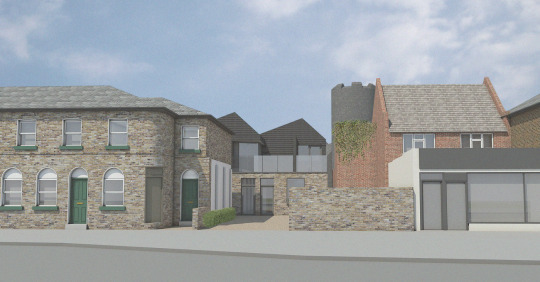 The site contains a derelict bakery that is in need of demolition and is unfit to reuse as a conversion, the replacement building however intends to use savalaged yellow london stock bricks from the existing building to carry on the legacy of the site. The new design takes an industrial aesthetic from the original use and the asymmetric roof has been informed by the roof of the existing building to maintain a familar streetscene. The black stained cladding is a found material in the locality and references the agricultural history of the area.